Why Animals' eyes Glow in the Dark? Animals’ eyes glow in the dark, due to the presence of a special reflective surface in their eyes, located behind the retina, known as Tapetum Lucidum. Almost all of us have seen an animal’s eyes glowing in the dark. While this fact makes for many a scary animal tales, it is also a beautiful and interesting aspect of the animals to study about. Essentially, an animal’s eyes glow in the dark, due to the presence of a special reflective surface in their eyes, located behind the retina, known as Tapetum Lucidum. The Tapeta of various animals are what makes their eyes glow in the dark. Basically, the tapetum lucidum acts as a mirror that reflects light entering into the eyes of an animal. When light enters into the eyes, it first hits the photoreceptors, which send information to the brain. Sometimes, these photoreceptors can’t function as usual because the light entering the eyes simply fails to hit them. In such an event, the tapetum lucidum absorbs the light and bounces it back in a mirror action, so that the animal can have a second chance at knowing what exactly is in sight. Not all animals possess the tapetum lucidum in their eyes. Humans along with some other primates don’t own this entity. Mostly, tapeta are useful for those animals who venture out at nights. Many carnivores such as lions, tigers, bears, etc. 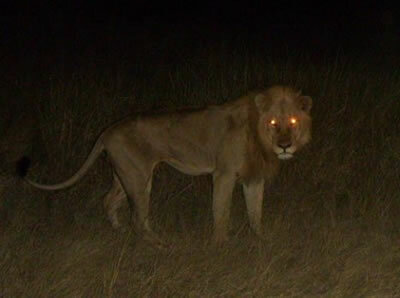 hunt at night, which makes having the tapetum lucidum extremely crucial. Apart from these animals, deer, dogs, cats, cattle, horses, ferrets, raccoons, etc. have the tapetum lucidum in their eyes. Another interesting thing about these glowing animal eyes is that each animal has its own distinct color of eyes, so the shine in their eyes at night courtesy of the tapetum, also differs from one another. The reason behind this is the content of substances like riboflavin and zinc in their eyes. The content of these substances is never alike in two or more animals, even if they belong to the same species. Factors like the animal’s age, nourishment, the amount of pigment in the retina, etc. also makes the animals eyes glow in different colors at night. Normally, most animals have eyes of colors ranging from light green to topaz yellow, but there are also exceptional cases where an animal’s eyes have appeared to be blue, or even turquoise in color. Why do animals' eyes glow at night?